Hope for Tomorrow is a dedicated charity, bringing cancer care closer to patients’ homes via our Mobile Cancer Care Units (MCCUs). As a cancer charity, we understand that time is a crucial factor for patients, and in 2007 we launched the world’s first ever Mobile Cancer Care Unit (previously Mobile Chemotherapy Unit) to bring vital cancer care closer to patients, enabling them to spend more time with family, friends and loved ones. We develop, build, provide and maintain MCCUs to support patients who are going through Chemotherapy by alleviating the stresses and strains of travelling for appointments, along with reducing hospital waiting times. We work in a unique partnership with the NHS helping to ease capacity challenges at hospital trusts. We now have 10 MCCUs operational in Gloucestershire, Somerset, South Wiltshire, Hampshire, East Kent, Lincolnshire, Cornwall, West Suffolk, East Essex and London/ Surrey, with two reserve MCCUs in place to ensure continuity of service during the maintenance schedule. We also provide a Nurses Support Vehicle with each MCCU, which allows the nursing team to travel to and from the daily treatment locations. 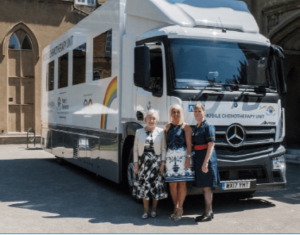 Since the launch of the first Mobile Cancer Care Unit (previously Mobile Chemotherapy Unit) in 2007, the charity has saved patients a total of over 2,000,000 miles and over 170,000 hours of travel and waiting time.